Although my blog is called Austen Hill and, if you're a regular reader, you know I frequently (nauseatingly) mention my dog Miss Austen, I realized when I sat down to write this post that I've rarely written about the author herself. Why is that? Well to me she's kind of always there, omnipresent, sitting quietly in a corner. She often gives silent advice with a disapproving smile or offers her acceptance with a short nod of the head. I lean on her self-effacing wit when I'm taking things too seriously and borrow from her literary tenacity when I need inspiration. I guess I figure you see her too so I don't need to mention her. Should I be heavily medicated? Possibly. Most people don't talk about a dead author who hangs out with them a lot. But I think most of its subconscious so lets agree that I'm probably sane and move on. This brings us to the real point of today's post. 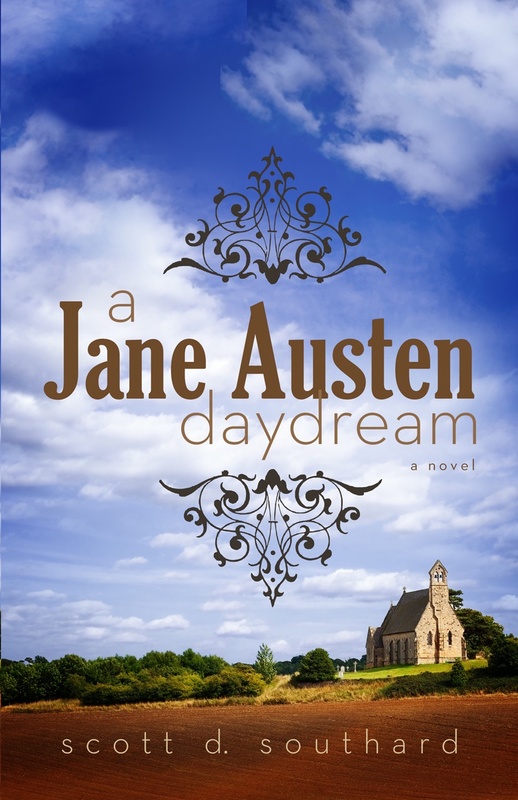 I recently had the chance to read author Scott D. Southard's new novel A Jane Austen Daydream and even interview the author himself. If you missed the interview just scroll down to Monday's post (I'm a fan of simple instructions). Back to the book. I'm happy to report that it was universally charming. Written in the style of Jane herself, it re-imagines her life and offers the reader a front row seat for the journey. Fans of Austen often ask themselves many questions because frankly we know so little about her. Where did she find inspiration for her characters and stories? What was her daily life like? Who did she love? The novel does a wonderful job of weaving a tale that answers these questions, even if there is a great deal of fiction to go along with the facts. I found myself thinking of it as a love letter to all of her novels. Readers will recognize characters from each scattered amongst her real-life family and acquaintances. A meddling matchmaker, a loving sister, a dashing suitor. Obstacles and misunderstandings.......triumphs and tragedies. Not to worry though, despite their appearance these plot devices don't seem contrived in the least. Split into three sections, it's also worth mentioning that I found myself drawn to the prologues for each. They offer quite a bit of hefty inspiration and create a wonderful frame for the reader's subsequent experience. The novel also does a great job of showing how Jane's own adventures in love might have influenced the lives of her characters. Speaking of love, the main thing all Austenites struggle with is how could a woman who wrote so eloquently about the subject not have found the happy ending she always managed to create for her characters? I think that if we take the happy ending out of the equation there can be no doubt that she not only experienced love, but felt it very deeply. Real love is rarely neat or perfect. It can be messy, sometimes inconvenient, amazing, enthralling, and so much more. People tend to focus on her endings but if they looked more closely at the rest of her stories I think they would see that love does not come easy for her characters. Do they all hope for a happy ending? Of course. But before Austen's characters can get there they have to work for it. When they meet, being together seems as right and natural as breathing. But they don't always recognize it. Society, money, family, and life all subsequently contrive reasons to keep them apart. What do they do? They fight through these obstacles. Emma finds her self-awareness, Elizabeth overcomes both her pride and her prejudice (in my humble opinion:)), and Anne finds her strength. Through these transformations they also find love. These are the happy endings we should hold onto, not with a suffocating tightness, but with a shadow of hope that the wish I think we all share might come true.......to finally be home. Too schmaltzy? Sorry, it's late and I've had a couple glasses of wine. So what do we do as human beings to get us through this quagmire of life? Well, when we need a tale that makes us laugh and hope for love we read Austen. Now I will also read Southard. I hope you will too. Amazing review! Very looking forward to reading this now having read your thoughts on it. Thank you for sharing.